On Sunday evening we received a message from our youngest daughter's teacher: "Would either you or your husband be able to come on the camping trip on Wednesday? We are short parents. Let me know. Bye." Mrs. G has been taking her class to Camp Squeah annually for ten years. In every other year but this one, not only has the weather cooperated, parents have clamored to go on the trip, but with the looming weather forecast and a few communication problems, four of the parents that had said they would go earlier in the year, pulled out at the last minute. I had not signed up because it seemed like so many other parents wanted to go, and until the teacher's phone call I had no reason to believe otherwise. I had also thought perhaps it might be a good opportunity for my daughter to have an adventure without her parents tagging along. My husband certainly could not go on such short notice, so I looked at my schedule and after school on Monday struck a compromise with Mrs. G. I could meet the class at the camp, which is only about a half hour drive from our house, on Wednesday noon, stay the night, and leave the following day at supper time. I had a couple of commitments this week, but could fit the camp in for 36 hours or so. She said yes to the compromise and I went home to get organized. The rain was pouring as I drove to the camp, the semi trucks spewing up clouds of mist. I pulled into the camp and parked behind our friend Jim who was one of the drivers. I found him and another parent putting the finishing touches on an elaborate system of tarps over the various tents. Although I had been invited to share the teacher's tent she informed me that plans had changed and some boys had been instructed to pitch me a small tent. I found the tent and began to put my things inside. I soon pulled them out. No ground sheet had been placed under the tent and the bottom was already soaked. I decided to sleep in the back of my van. At least I would be dry, there would be room for my daughter if her sleeping situation was not working out - her group's tent walls were already wet on the inside - and I prepared for a bit of a rough night. Oh well, I told myself. I will survive, as would the kids, if no one caught pneumonia before morning. I joined my daughter's group at the high ropes course for their afternoon session. The other group was canoeing. After nearly every child gave the course a try, I decided to give it a go and chose an element which consisted of a wire stretched tightly between two poles. I climbed the pole on the right, using the large metal staples which had been inserted all the way up to a wire suspended at about 35 feet in the air. I was, of course, in a full harness and attached to a rope/pulley system held on the ground by one of the instructors, but I was still fairly nervous at being so high up. I began to make my way across the wire to the other side, holding on to the ropes hung at various intervals along the way. I discovered that sliding my feet and keeping my heels down helped to steady me. When I reached the other side I was instructed to lean back and was let down to the ground. Good fun, but I was glad to be on solid earth again. Later on in the day I went in to our group's lodge to help with supper. The lodge, which was warm and dry, housed bathrooms, a food preparation area and a large meeting area with couches. As all the kids came in from their activities, many complained of wet feet and wet towels, and asked, 'where do we hang our stuff to dry?' Very good question, I thought. We would be lucky to make it through the night at this rate. Soon afterwards an instructor offered the use of a large industrial propane dryer in the back room of the building, and we began what was to be a fairly constant cycle of drying wet socks, pants, hooded sweatshirts, and towels. We could not dry shoes, and many of the kids still had wet feet when they returned to the school on Friday afternoon. After a good supper that night of pasta, garlic toast and salad, the teacher made an announcement. We had been offered the use of the cabins. While a few hearty and well prepared kids decided to stay in their tents, most decided to move into the cabins. The teacher, another female parent and I occupied a deluxe, and slightly musty cabin which even had a bathroom and a small kitchen of sorts. In comparison with how I thought my night would be spent in the back of my Honda van, the cabin seemed like The Ritz. I settled into one of the three bedrooms and then joined the rest of the group around the campfire for an evening of stories, s'mores, and games. Bedtime was to begin at 10:00. By 10:20 my tired daughter had left her cabin full of girls who were not nearly as eager for sleep as she was and joined me in my room. We enjoyed a fairly good night's sleep as the rain fell with the constancy of a waterfall. The next morning we awoke to more rain and we adults rose early-ish to make a hearty breakfast of eggs, ham and cheese served on toasted English muffins, with orange juice and camp coffee. I joined my group on a nature hike in the dripping rainforest and then helped with lunch. After lunch, I helped with the clean up while my daughter's group went canoeing. I kept an eye on the big dryer, folded clothes and arranged them on the picnic tables for the kids. Then, I packed up my own things. I visited with the other adults for a while and then said goodbye to my daughter who was enjoying herself at the archery range. I drove home, my windshield wipers on low by now, a bit sorry to be leaving the camp, but I had a singing engagement for the evening. I needed to get home, eat supper, shower and warm up my voice. Even though it had rained constantly, the beauty of the forested setting of the camp was not dampened. The scent of rain-soaked ferns, moss and cedar filled me up with the sense of well-being I always have in the forest. I shared that well-being with the kids, who although fairly wet a lot of the time, were generally delighted with all the activities and opportunities for fun on the trip. They appreciated the food, the warm, dry clothes and towels after canoeing or hiking in the rain. They lined up gratefully for hot chocolate and participated in the campfire games with enthusiasm. Any attempts to hold on to their carefully guarded too-cool-for-school persona, seemed all but washed away in that setting, and then warmed up by the campfire they helped to make with old man's beard, a dry moss which hangs off tree limbs, in their bush-craft classes. Not everyone behaved perfectly, but overall a general sense of camaraderie pervaded the atmosphere and it was easy for me to enjoy the kids, and to embrace the experience. I felt lucky to be there, and lucky to have such good rain gear. The camping trip reminded me of the importance of exposing children and families to outdoor experiences, to the challenges they present and also the opportunities for self-knowledge and improvement. Many of the kids who conquered elements on the high ropes were amazed at themselves. One particular girl came out of her shell in a big way and joined in all the girl chatter in her cabin, much to the surprise of her bunk-mates. I heard one boy thank my daughter for teaching him 'that cool game last night'. My daughter is not one of the cool kids, but in her own way, she is a leader. I saw proof of that fact when the teacher asked her to lead some drama games around the campfire. Everyone, including the adults, had so much fun playing 'Bang!' and 'Concentration'. The boys and girls who persevered in the tents were proud of themselves, and the less well-prepared ones who decided on the cabins were relieved and grateful for the rescue from inevitably wet bedding - most department store tents are not made for wet conditions. (There is also an art to setting up tents in the rain, and tarps can only do so much.) I remembered my family's years working and living in a camp setting similar to Camp Squeah. All the hours spent outside, rain or shine, the hikes to the lookout, the swimming, canoeing and kayaking in the lake was time spent in the best and healthiest way for my children, myself and my husband. Those years formed us into people who seek the benefits of a healthy lifestyle, although it is not always easy keep up the standards we once maintained as a family as the kids get older. 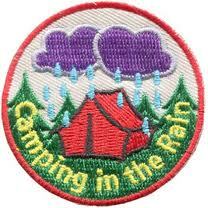 This summer, I vow to spend more time with my kids outside, and I am determined to get some more camping in. It is far too easy these days to allow ourselves to become overloaded with tasks or distracted by things that do not, in the big picture of life, really matter. True perspective is so easily lost and the wrong things can become relied upon to soothe and entertain us. I also hope for the kids I spent 36 hours with this week. They have seen and experienced what their lives can be like with lots of exercise, fun, healthy food and fresh air, even in the rain. Perhaps they can take a little of that, hold onto it, and let it define their future for the better. The badge above is available here. I'd like to order one for all the kids. We waited two months for BC Children's Hospital to call us with an appointment date. Then, when we got that, we waited another two months for the actual appointment. 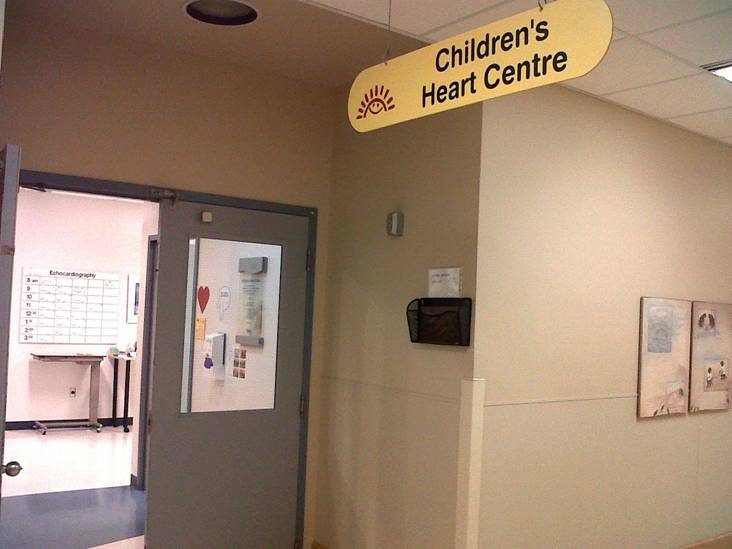 All that time we reassured our daughter that the pediatric cardiologist just wanted to do some tests, and if the doctors had thought the situation serious she would have been tested straight away. Still, if one is eleven years old with an imagination as big as a rising hot air balloon, and one hears the words 'tests on your heart', one is bound to be a little nervous as the date for those tests approaches. Our daughter had fainted at school back in January and scared her teacher by the jerky motions of her faint. She had not swooned or simply dropped to the floor. She had rocked backwards, then forwards, then dropped shaking onto the floor. We took her to our family doctor who decided to run a few tests on her blood, an ECG, blood pressure, etc. While everything to do with her blood was fine, the ECG came back with an indication suggesting an enlarged left ventricle and a request for an appointment at Children's was dispatched from our clinic. I knew our girl had been thinking about her appointment because the day before, when her brother spoke to her about it, she had a little speech prepared for him, "Oh yeah, they are just going to do an Echo test on me - that's a sort of ultrasound for my heart and stuff, and then another ECG and then we'll meet with the cardiologist. Mom said if it had been really serious I would have been sent to Children's right away, so this is just sort of routine stuff to make sure I'm okay." All delivered with exaggerated cheerfulness. The day arrived, clear and sunny for a drive into Vancouver. We had to leave by 7:30 a.m. to account for traffic, and on the advice of our friend Kim, whose son is a cardiac patient having had a couple of major surgeries at Children's, to find a parking spot. Traffic was heavy and we finally pulled into the Children's Hospital parking lot off 28th Street, also on the advice of the experienced Kim, at around 9:30 in plenty of time for our 10:00 appointment. I had read the letter sent from the hospital and had preregistered the day before, so there was no need to wait in line for a hospital blue card. The cardiac unit already had it. We found our way to the cardiac unit and as we walked down the hallway I noticed artwork everywhere I looked, some of it done by children, and some done for children by adult artists. The cardiac unit was full of colourful vinyl covered sofas, toys, more wonderful artwork, a large television showing one of the Shrek franchise films, and of course families. Children, all much younger than our long-legged daughter, played in the toy corner. Parents waited. Doctors and technicians called family after family. I attempted to read my book. Our turn came and we went with our daughter into the Echo room. My husband and I were seated on our choice of rocking chair, exercise ball, or regular chair. Our daughter was hooked up and we settled in for a sleepy half hour in the darkened room while Disney's Enchanted, our daughter's choice of movie played on the little TV screen mounted on the wall across from her. My husband and I watched the computer screen from time to time, recognizing valves and arteries, but not much else inside our daughter's chest and tummy. When the Echo test was done we went out to the waiting room again. At one point two young women came around with a cart full of board games offering to play with any child. There were no takers, but I was impressed with the thoughfulness of whomever had come up with that idea. Shortly after, we were directed into an ECG room, but the machinery was having static issues, so we went into another. The ECG was a quick test and we went back out into the waiting room and listened to, and shared smiles with, families speaking various languages to their children. I felt sympathy for any family for whom language was a barrier to understanding what was needed for their children. However, efficiency and kindness are paramount in Children's hospital, it seems. We never had to wait long at all. Soon, a short-ish woman in what appeared to be her mid to late sixties with a British accent rounded off by many years in Canada, black framed glasses and a friendly smile called us in to her office for a consult. She began by asking our daughter to describe her fainting spell, examined our daughter's chest and stomach, and had her to do a few exercises with a blood pressure cuff on. When the examination was over the doctor sat down again and said to our daughter, "Well, I think you have a healthy heart." Our daughter has an expressive face, but her whole body expressed her relief at the doctor's diagnosis. "Really?" she exclaimed. "Yes. Why? Did you think there was something wrong with you?" said the doctor, smiling. "YES!" And we all laughed with her. We then asked the cardiologist why the original ECG had shown an enlarged left ventricle. She explained that ECGs were only one piece of the puzzle when it came to the heart. Our daughter and one of our sons has a chest that is slightly concave in the middle. She gave us a medical term for it which went in one ear and out the other, but apparently the shape of our daughter's chest moves things around a bit inside giving the impression on the ECG of an enlarged left ventricle. After a few more questions on our side and some serious advice to our daughter from the fit-looking cardiologist with the Ironman Timex watch to get plenty of exercise, and also to be careful of rising too quickly after a long time sitting, we were on our way, an hour earlier than predicted. We went downstairs to the Second Cup cafe to celebrate our daughter's good health with a treat. As we drove to our next stop, I felt so thankful. I thought of all the children for whom the news had been and would not be so good. I thought also, as I had over the past few months of waiting for our appointment, of my beloved sister in law, Lea who had developed pulmonary hypertension by her late twenties and had undergone a heart and double lung transplant in 1992 which she survived only a few short months. I knew that great advancements had been made in the field of cardiology since Lea's surgery, however, and silently wished everyone I had met in the Children's Hospital cardiology unit that day success with whichever treatment their child might need, from the bottom of my blessedly healthy heart. I didn't take the photo above. I got if from the BC Children's Hospital website. It is however, just how the entrance to the heart centre looked on the day of our visit. Since, in the past week we have had both a cougar sighting (a hungry young male driven off the mountain by his stronger competition) and a mugging in our little town, and for the fact that a tractor-trailer flying by me much too close for comfort this morning nearly caused me to jump for my life into the ditch, I have resurrected a little prayer I came up with and used to say to myself as I ventured forth into the wilderness on my thrice-weekly, often gloriously solo, runs on the road and pathways of the environs of our home at Strathcona Park Lodge. Running up there in that beautiful wilderness I came across cougar tracks in the snow but never a real cougar, saw a black bear a few times that lifted its head slowly from its feast of fresh spring grass to observe my passing, did get run into the ditch by an RV once, but never encountered anyone attempting to steal my purse. Of course, I would not be running with a purse, and bear spray has more than one use. The photo above is one I took on a family trip through Alberta in 2010, and is of a typical Canadian highway along which someone like me might choose to run.